Where will you spend your eternity ? WHERE WILL YOU SPEND YOUR ETERNITY? Friend, there’s an eternity kept before you. You are heading for eternal life or eternal damnation one or the other. 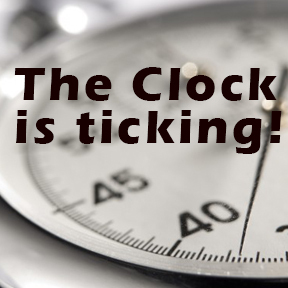 “The hour is coming, in the which all that are in the graves shall hear His (Jesus’) voice, and shall come forth; they that have done good, unto the resurrection of life; and they that have done evil, unto the resurrection of damnation,” says the Bible (John 5:28,29). Do you know where you are going? 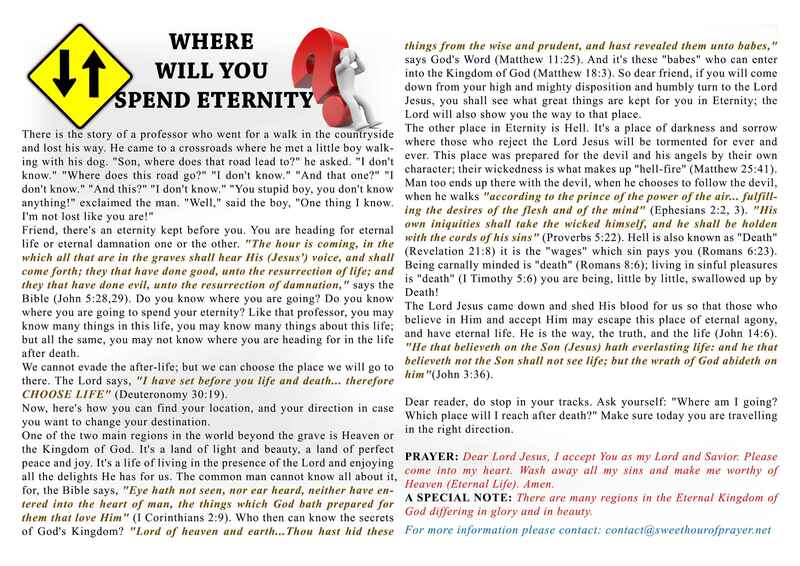 Do you know where you are going to spend your eternity? Like that professor, you may know many things in this life, you may know many things about this life; but all the same, you may not know where you are heading for in the life after death. We cannot evade the after-life; but we can choose the place we will go to there. The Lord says, “I have set before you life and death… therefore CHOOSE LIFE” (Deuteronomy 30:19). Now, here’s how you can find your location, and your direction in case you want to change your destination. One of the two main regions in the world beyond the grave is Heaven or the Kingdom of God. It’s a land of light and beauty, a land of perfect peace and joy. It’s a life of living in the presence of the Lord and enjoying all the delights He has for us. The common man cannot know all about it, for, the Bible says, “Eye hath not seen, nor ear heard, neither have entered into the heart of man, the things which God bath prepared for them that love Him” (I Corinthians 2:9). 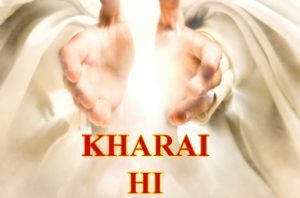 Who then can know the secrets of God’s Kingdom? “Lord of heaven and earth…Thou hast hid these things from the wise and prudent, and hast revealed them unto babes,” says God’s Word (Matthew 11:25). And it’s these “babes” who can enter into the Kingdom of God (Matthew 18:3). So dear friend, if you will come down from your high and mighty disposition and humbly turn to the Lord Jesus, you shall see what great things are kept for you in Eternity; the Lord will also show you the way to that place. The other place in Eternity is Hell. It’s a place of darkness and sorrow where those who reject the Lord Jesus will be tormented for ever and ever. This place was prepared for the devil and his angels by their own character; their wickedness is what makes up “hell-fire” (Matthew 25:41). Man too ends up there with the devil, when he chooses to follow the devil, when he walks “according to the prince of the power of the air… fulfilling the desires of the flesh and of the mind” (Ephesians 2:2, 3). 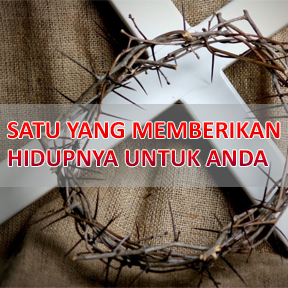 “His own iniquities shall take the wicked himself, and he shall be holden with the cords of his sins” (Proverbs 5:22). Hell is also known as “Death” (Revelation 21:8) it is the “wages” which sin pays you (Romans 6:23). Being carnally minded is “death” (Romans 8:6); living in sinful pleasures is “death” (I Timothy 5:6) you are being, little by little, swallowed up by Death! The Lord Jesus came down and shed His blood for us so that those who believe in Him and accept Him may escape this place of eternal agony, and have eternal life. He is the way, the truth, and the life (John 14:6). “He that believeth on the Son (Jesus) hath everlasting life: and he that believeth not the Son shall not see life; but the wrath of God abideth on him”(John 3:36). Dear reader, do stop in your tracks. Ask yourself: “Where am I going? Which place will I reach after death?” Make sure today you are travelling in the right direction. PRAYER: Dear Lord Jesus, I accept You as my Lord and Savior. Please come into my heart. Wash away all my sins and make me worthy of Heaven (Eternal Life). Amen. A SPECIAL NOTE: There are many regions in the Eternal Kingdom of God differing in glory and in beauty.